Danny Boome is a Professional Chef, TV Host and Brand Ambassador known to audiences for his culinary work in the U.S., Canada and the U.K.
Boome can currently be seen as the host of ABC’s new weekly syndicated television series “Recipe Rehab”, where professional chefs give cherished family recipes a healthy make-over. Boome is also excited to make his return to Canada in 2013 as the host of a soon-to- be announced series on Food Network Canada. 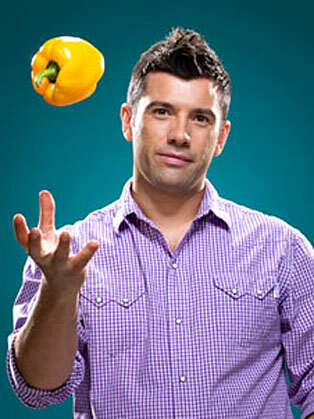 In 2011, Danny made his debut as a “Chew Crew Correspondent,” on ABC’s daytime lifestyle show “The Chew,” working as a roving reporter bringing viewers the latest culinary news by covering events and dishing on new and exciting food trends, while also offering great simple recipes from around the country. In his Food Network series, “Rescue Chef”, everyday cooks experiencing personal culinary obstacles welcomed Danny Boome into their homes to save the day. As the “Rescue Chef” he offered viewers creative solutions and a true understanding of the basics necessary for success in the kitchen. Boome brings his passion for food and culinary exploration to homes, schools and lecture halls across America as well, where he shares his fresh perspective and practical, no-fuss recipes and techniques through cooking workshops, courses and private lessons. Chef Boome also works as a National Brand Ambassador for T-fal cookware. Danny started his culinary training in 1999 as a cook in Switzerland doubling up as an au pair for a local family. He later trained at the acclaimed West Wind Inn in Canada and attended the Grange Cookery School in England. His first post as a young chef was at the fashionable Asia de Cuba restaurant in St. Martins Lane London Hotel, which ignited his passion for fusion cookery. Boome launched his television career in 2004 on UKTV Food’s co-production “Wild and Fresh” where he travelled across Canada seeking out the best home- grown delights each province had to offer. He returned to England to host “Danny By the Sea”, “Coastal Kitchen” and “Local Food Heroes” and had a regular spot on ITV’s “Summer This Morning”. In 2008, Boome became the “Rescue Chef” and was an international spokesman for Samsung Refrigerators. A former English professional ice hockey player, Danny is an active sportsman who enjoys traveling and working with his non-profit organization, Better Fed; The organization works with schools to explore community-based food education programming to help Americans become more empowered with their food and lifestyle choices.